Inducted 2000. Earned 12 Varsity Letters During 1970’s. Class of 1979. Karen (Heinze) Williams, a 1979 graduate, was one of the most talented female athletes in the history of Notre Dame and helped establish the foundation for one of the state’s premier athletic programs for girls. She received 12 varsity letters in three sports – basketball, softball and volleyball. In four years on the volleyball court, Williams never missed a game, playing in 97 consecutive matches. As a freshman, she was named the most improved player on the 1975 team. She was chosen the team’s most valuable player as a junior in 1977, when the Lady Raiders finished with a 30-1 record and second in the state. She was a member of the 1978 state championship team that posted an undefeated record. In that year, the team was chosen as the MVP. Williams was named to the all-state tournament team in both her junior and senior year. Williams was a four-year starter on the softball team, playing centerfield and also pitching on occasion. She used her speed to become a dangerous leadoff hitter and excellent outfielder. 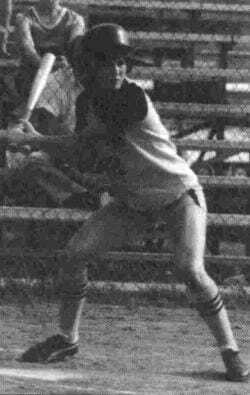 Her career batting average was .316, and her career on-base percentage was .392. Her record as a part-time pitcher was 6-1. Bill Starkey, Williams’ coach in volleyball, called her one of the top hitters in Class A volleyball during the Lady Raiders’ runs to the state tournament. “She was a dominant hitter, an excellent passer and a strong server,” he said. Williams and her husband Steve live in Quincy, and they have two children, Blake and Brooke. She is employed by JC Penney in the Quincy Mall as the manager of the beauty salon.